Two days after his release from a Manhattan hospital, Five Days until he hands over the reins of the nation's second-largest diocese, Cardinal Edward Egan will preside at tonight's Evening Mass of the Lord's Supper in St Patrick's Cathedral. Edward Cardinal Egan will celebrate Mass for Holy Thursday at 5:30 p.m. today in the Cathedral of Saint Patrick. He also plans to participate in the Good Friday service, preaching on the Seven Last Words of Christ at noon Friday, and to celebrate Easter Sunday Mass. 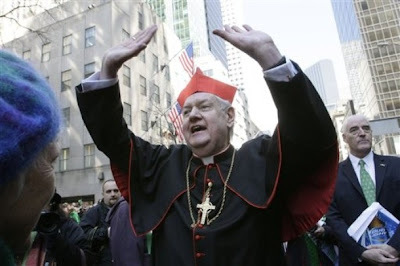 In addition, Cardinal Egan will be available for a brief standup/availabilty at 4:00 p.m. in the Cathedral. Along with all the Triduum ceremonies, the Mass can be heard on the Big Apple church's Catholic Channel on Sirius XM Radio -- for non-subscribers, the streamable free three-day preview is available as ever. Later today, the special edition of Catholic New York welcoming the tenth archbishop will drop. In the paper's last fortnightly spread, however, Egan quietly rowed-back comments made in early March that seemed to indicate his support for a review of mandatory priestly celibacy in the Latin church. In a clarification, the cardinal called the millennium-old discipline "one of the church's greatest blessings," admitting that, in future, he "will have to be more careful about trying to explain a somewhat complicated matter in 90 seconds." Give the man credit -- for once, he didn't blame the press. One last Transition Digest to go before the Triduum... then off to Gotham for stem-to-stern coverage of Installation Week.